​These are Thursdays with a start time of 11.15am. There is free parking on site. Thank you for joining our Relax Classes. We use Vitali-Chi, a healing relaxation circuit that helps conduct your energy around your body. Our classes help you to connect to your inner self and release emotional pain, which can store as physical pain. There are many benefits to our classes, if you would like more details, please do ask. If you have a friend who would like to join our sessions, they can have their first session half price. As a thank you – you will also receive a half price session. We can also offer sessions in the work place, schools, hospitals etc – again, please do ask for more information. Socks, a drink, warm blanket, additional cushions and if you need, additional floor matting or comfortable chair. We want you to get the most out of your session, and your comfort and warmth are an essential factor. 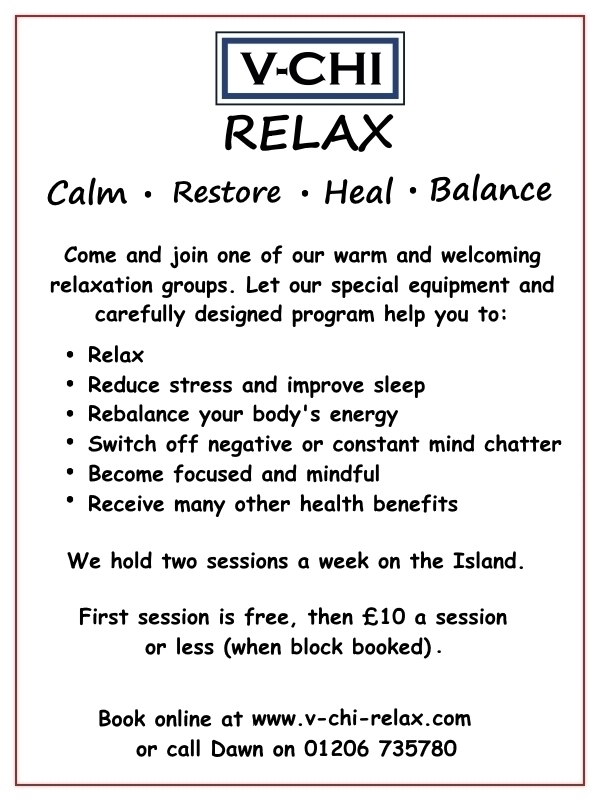 Classes are £10 a session, or £49.50 if you would like to pre-book a block of 6 sessions in advance (giving you a free session). Four times a year we have a mini retreat. 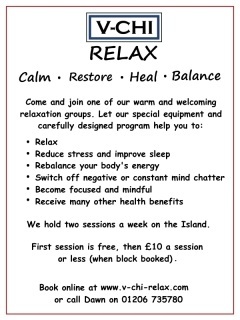 These sessions are for 3 hours and include a light vegan lunch (such as a soup, yeast free bread and a pudding) and a 90 minute Relax session. These sessions are £25 per person and are not of the general pre-payment scheme. (though booking is essential and they are popular). Please state your name as a reference and follow up with an email confirming the dates you would like to book. Your place is then guaranteed for those sessions (subject to availability). Your first session is half price! We now have a Face book page. Please check it out here. Book either by phone on the number above, or use the contact form here . You can either pay at the venue or I can send you an invoice for electronic payment. This booking is for one session.. This option gives you a free session when you pay for 5 in advance. Simply use the contact form once payment has been sent to book the 6 session dates that you want to attend.